Casa Conde´s atmosphere is more than just friendly and comfortable, they offer you the most modern and largest Apartotel in Costa Rica . Enjoy 110 fully-furnished two-bedroom luxury suites, equipped with a kitchen, dining room, living room with sofa bed, 25-inch TV, DVD player, home theater system, air conditioning, secure parking and all the amenities to make you feel right at home. Your comfort and peace of mind during your stay, is of utmost importance to them. They therefore provide 24-hour security, laundry service, prescheduled hotel-airport transfers, and cutting edge technology business centers, along with wireless internet access, presentation equipment, fax, photocopy machines, scanners and for your recreation and confort they offer restaurant “Rincón del Conde”, jacuzzi, sauna, gym and pool. 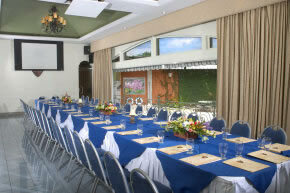 Three customized, comfortable rooms are available for your events, both social and corporate. For corporate events we have cutting edge technology available for your use. They cater to your needs by organizing your special activities such as corporate meetings weddings, baby showers, bachelor’s parties, among others.